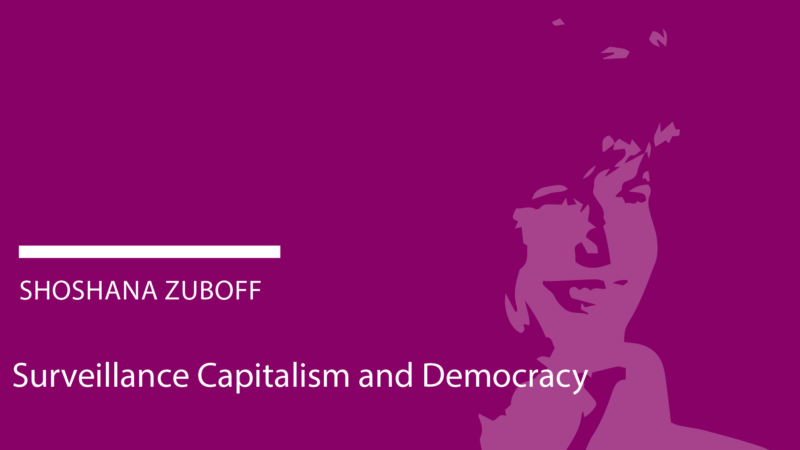 Unfortunately, we have to cancel the event with Shoshana Zuboff on 16 October due to illness. There will probably be an alternative date in early 2019. Sign up for the next event of the lecture series Making sense of the digital society: On 20 November, Nick Couldry will talk about “data colonialism”. We apologize for any inconvenience and thank you for your understanding. The collection and analysis of data is changing the way economies operate. Are these changes so fundamental that they can be said to have led to the emergence of a new form of capitalism – surveillance capitalism? If people’s behaviour is made increasingly transparent, do we become a society in which trust is no longer necessary? Are individuals a mere appendage to the digital machine, objects of new mechanisms which reward and punish according to the determinations of private capital? How is social cohesion affected when people become dispensable as a labor force, while their data continues to provide function as a source of value in lucrative new markets that trade in predictions of human behavior? How should we understand the new quality of power that arises from these unprecedented conditions? What kind of society does it aim to create? And what ramifications will these developments have for the principles of liberal democracy? Will privacy law and anti-trust law be enough? How can we tame what we do not yet understand? Shoshana Zuboff was one of the first women to hold a chair at Harvard Business School in 1981. In 1988 she wrote the best-selling and long-selling book “In the Age of the Smart Machine”, in which, as a social scientist and economist, she predicted technological developments and the resulting control mechanisms. Her term “Dark Google” in 2014 marked the debate about the digital future and big data. The magazine strategy+business describes her as one of the eleven most original economic thinkers in the world. Her new book The Age of Surveillance Capitalism: The Fight for a Human Future at the New Frontier of Power, will be published by Public Affairs in the U.S. and Campus in Germany in 2018. Alexander von Humboldt Institute for Internet and Society (HIIG) and the German Federal Agency for Civic Education/bpb are organising an academic lecture series on Making Sense of the Digital Society. The high-profile series thrives to develop a European perspective on the processes of transformation that our societies are currently undergoing. It started with an inaugural lecture by Manuel Castells about power and counter-power in the digital society in December 2017 and was continued by Christoph Neuberger, Elena Esposito and Marion Fourcade and Stephen Graham. Nick Couldry is the upcoming speaker of our lecture series.